Many organizations start their agile journey by adopting Scrum because it describes a good strategy for leading agile software teams. However, Scrum is only a part of what is required to deliver sophisticated solutions to your stakeholders. Invariably teams need to look to other methods to fill in the process gaps that Scrum purposely ignores. Mainstream agile methods provide a great starting point but require significant effort to make them scalable. To address these challenges the Disciplined Agile Delivery (DAD) process decision framework provides a more cohesive approach to agile solution delivery. DAD promotes a full end-to-end delivery lifecycle from team initiation all the way to deliver the solution to your stakeholders. Another issue with Scrum is that a deployment is typically performed at the end of a two to four week Scrum sprint, resulting in deploy a usable piece of “working software”. However, some (if not many) enterprise organizations are unable to deploy new functionality every two to four weeks into production. 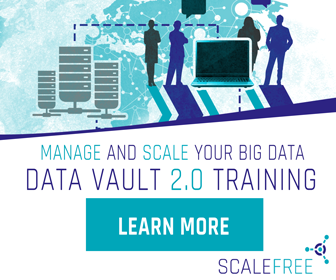 If deployments in your organization can’t be done in an agile Data Vault 2.0 sprint, DAD is the answer which is fully adapted in the Data Vault 2.0 concept including the methods like Scrum, CMMI, Six Sigma, and more. Instead of deploying new functionality after every iteration, new functionality is “bundled” by every iteration into a change set that is deployed at the end of a release. Typically, a release has a fixed length again, but consists of a longer duration, e.g. a quarterly release would produce 4 releases a year. Each release consists of three phases (Inception, Construction and Transition phase), whereby each phase consists of multiple Data Vault 2.0 iterations. Governance establishes chains of responsibil­ity, authority and communication in support of the overall enterprise’s goals and strategy. It also establishes measurements, policies, standards and control mechanisms to enable people to carry out their roles and responsibilities effectively. You do this by balancing risk versus return on investment (ROI), setting in place effective processes and practices, defining the direction and goals for the department, and defining the roles that people play with and within the department. Please note: This class is not technical and is suitable for all team members.